Using Dreamweaver? After connecting, set up Dreamweaver. In Finder, type the key combination ⌘-K or select from the menu Go > Connect to Server. Type in the server address smb://msfs-share.cts.wwu.edu/campusweb and click the connect button. From This PC or My Computer, select Map Network Drive. 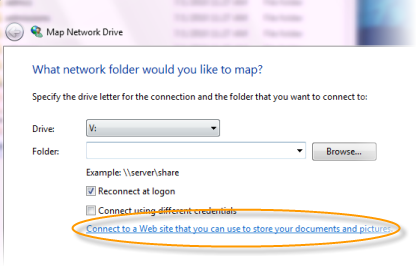 Select Connect to a Web site that you can use to store your documents and pictures . Your network drives will now be accessible under My Network Places. When I try to connect to the server it says that the server doesn’t exist, or I am unable to connect at this time. I already did the VPN process, but I can’t seem to get connected to the school network. Any help would be greatly appreciated. Sorry, you are having trouble logging in! Please e-mail ATUS.helpdesk [at] wwu.edu to have your permissions corrected.